Modern trading success doesn’t require a terminal, and can even benefit without one. The flexibility and market exposure that mobile devices bring to trading are highly beneficial. Modern tablets and cellphones are as powerful as the computers of just a few years ago, and accordingly can perform just as well at many tasks. While there is sometimes no substitute for a mouse and keyboard, market trading is one of the many areas where a mobile device can match a desktop in terms of performance. Fast wireless internet heralded the introduction and increasing popularity of mobile trading in the last ten years, with investors easily able to manage their portfolios from wherever they desire. The proven reliability of security, speed, and similarity to well-known desktop trading platforms enables one to have an unrivaled focus on and exposure to the markets, which in turn increases trading effectiveness. After all, the market will not wait for you to get back to your desk. 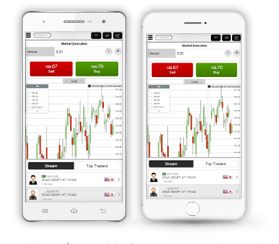 The difference between a platform like the MetaTrader4 and a mobile trader is certainly great. However, a well-designed mobile platform combined with the knowledge of how to use it appropriately, plus its limitations and strengths can make this difference altogether negligible. An excellent example of a mobile trading experience along these lines is available through Alvexo. A modern, lightweight application, Alvexo’s mobile trader only takes a few seconds to download, which is a short commitment in contrast to the plethora of benefits it gives traders of all kinds. Similar to deeper and more thorough platforms like the MT4, the web trader retains all of the functionality but simply changes the interface. Download the Alvexo mobile trader from the iOS App Store or Google Play. Web trading through a platform like Alvexo’s means not having to sacrifice performance or functionality, and true to this statement, the web trader offers the full experience. One-click trading makes reacting to market news fast and seamless, and the news itself is effortlessly available. Real-time tools including profit and loss on all of your positions, popular charting tools and more are also within eyesight. With limited real estate, what is within eyesight becomes the most important differentiator between mobile platforms, with the design of each screen in any mobile trader required to be meticulously crafted in order to put the most important, execution-centric information in front of the user. Alvexo’s is one of the better examples. What at first may seem to be a clean interface quickly reveals surprising depth. Your entire trading history is accessible, as well as several chart types, punctual trading cues and every type of trade position. Set stop-loss and take-profit levels, conditional trades and of course receive SMS signals on relevant assets in the meantime. Alvexo’s goal is for every trader to know exactly what step of a transaction he or she is currently on, and to have a clear path towards a confident execution regardless of how much information is within reach. Why Mobile Trading with Alvexo? Besides having one of the best mobile apps for trading, Alvexo also offers a mobile version of the popular MT4 platform and also a web trader that requires no download. Each benefits from the excellent trading conditions inherent in any Alvexo trading account, which means the lowest spreads in the market, high leverage if you should so choose, and access to a veteran support team. Questions or concerns with any of our array of platforms are easily solved by the team, and if one would simply like to try the experience before committing, a $50,000 demo account is freely available. Be confident, and be flexible. If you’re a serious trader, place your trust in the fact that developers have spent years ensuring that as long as you have a connection, your trades are as secure and quickly-placed as they are from any other source. Because of the reliance on a connection, it is suggested that if you are mobile trading that you stay engaged. While these days a signal is rarely lost, without focus on the process it may be hard to determine if the information you are currently seeing is the most updated version. Finally, spread the word! Show fellow traders your Alvexo application and explain some of its benefits. Open or close a trade with them watching, if possible. The more people trading on mobile the better your network, and the more information you have the better your trade effectiveness, especially if you carry with you a market live stream in your pocket. Check the validity of market data you heard from the grapevine, and trade on your findings all without leaving your sunny park bench. Sign up for Alvexo today and get free access to today’s top trading techniques, mobile trading platforms, new trader bonuses and more. Don’t be afraid that the lack of a cable connecting your device means your profitability will be impacted. The best advice to give concerning the modern world of trading is to simply immerse yourself and see how it works for you. The interconnectivity should see your trades soar to new heights.